Two months ago on the 13th of March, Augusta Engineering Director Dr. Hameed Malik appeared before the Engineering Committee of the Augusta Commission to provide an update on the downtown Transportation Investment Act projects. Please listen to these comments by Dr. Hameed referencing the need for Augusta to cut, downsize, delay, and even cancel the TIA projects in the middle of the program and especially the end of the Augustan TIA program. At the end he mentions discussions to do another REGIONAL TIA with other counties. What? Augusta gave away $109 million to 12 other counties to make TIA work and its OWN projects face lack of funds? Only in Augusta! What? The projects at the end are short of money after the Augusta National Berckmans Road TIA projects were built to the hilt? What? The first project completed, Riverwatch Parkway was to cost $30 million ($20 million TIA) but news reports said the TIA money was $30 million and the total cost $65 million. Doesn’t this scream that the 15% revenue shortfalls and enormous overruns mean that the out of control program needs a new regional one to cover it all up, and, as Dr Hameed said, to finish the present TIA projects? 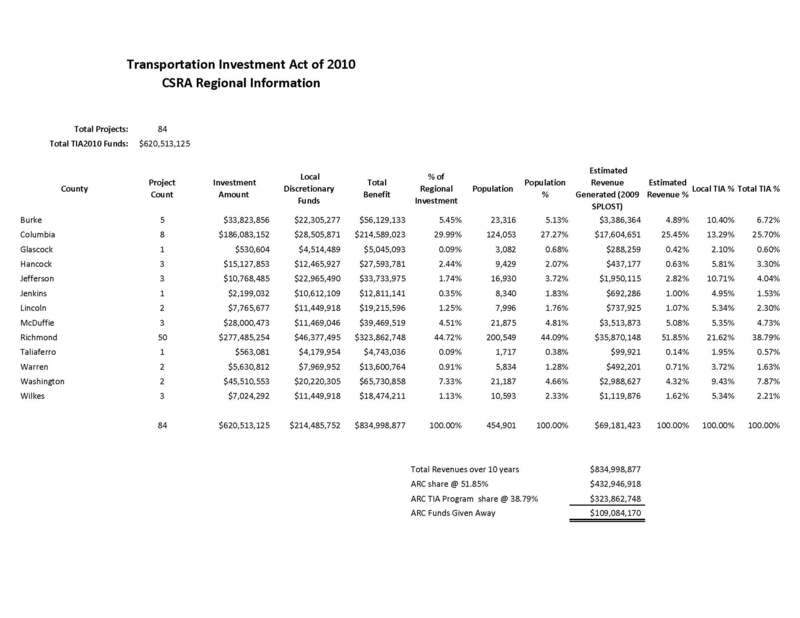 Why are the politicians not telling the good people of Augusta and Columbia County, the other major donor county, that the Georgia Legislature passed Single County TIA/Tsplost in 2016, so Augusta could keep its $109 million after 2022? Even tiny Dade County can have its TIA without all of these complications.The 2016 bill prohibits getting out of a regional TIA mess until it is complete, so they are stuck. Agraynation.com readers will recall several downtown projects got sent to the back of the TIA bus to allow the Augusta National finagling to build the Berckmans Road project to the max. Furthermore, during the TSPLOST debate and later this site provided enough facts to the public that Columbia County decisively, including the financial trickery in the numbers now apparent in the 16% shortage in funding. Senators Hardie Davis, Jr. and Bill Jackson of the Augusta Delegation hatched this money transfer out of Augusta back in 2010. Now the damage is coming clear. Why do establishment politicians continue to embrace a failed regional government while feeding it Hundreds of millions of dollars? Why do none talk about the double taxation that hit Augusta area to the tune of another $550 million with the new fuel taxes in 2015? Only Representative Barry Fleming showed the bravery to promise corrective action. Elect folks like Barry. Send the others down the road where they sent your money. This holey bucket, made up as a prop for one of your SPLOST meetings, is stunningly perfect as a depiction of Augusta’s Sales Tax Program. Properly designed, your liquidity slowly meters out one hole in the bottom, but the way this one is, liquidity spurts out all over the place, leaving the tree to wither. Augusta has been to the well too often with a bucket like this and this might be the final trip before the well is dry. When you have a $12 million parking deck funded with sales tax built on land you did not own, that is a pretty big hole. When you have $2 million of sales tax funded kitchen equipment you were not supposed to pay for, exchanged for land that was supposed to be donated, that is a doubly big hole. When those sales taxes build a facility that drain the general fund, to the tune of $250,000 a year for 50 years to pay staff that were free under another agreement, that hole becomes a gaping maw. When you use sales tax to fund a municipal building and don’t use the right contracting, $20 million doubles to $40 million, on the way to $65 million. When you don’t recapture what contractors owe you, you lose $750,000 on your sewage contract, close to $150,000 on an office building, and untold $ millions on a convention center. Those are the big holes. The liquidity lost from myriad smaller ones may be greater, because Augusta doesn’t even have a sales tax program control manual built into its sales tax management contract. The liquidity coming in from SPLOST, shouted to the heavens in timely initiatives designed to promote the SPLOST vote, isn’t there and won’t be there. For instance, past Splosts made streams of interest income that have evaporated and been further diminished by use of high cost or inefficient banks, as Columbia County may be learning. People get excited about lining up with the holes in your new SPLOST too. The Marriott folks want a $1 million skywalk, we see. Before giving them the money, which a former commission approved, wouldn’t it be prudent to see if there are offsetting charges from Augusta back to the Marriott? The Augusta citizens whom I was helping two years ago looked into several areas potentially offsetting that $1 million but were stonewalled by Fred Russell. Most of those centered on the Conference Center contract that was extended. The biggest hole of them all is a chasm where truth should be. When the “news media” is so embedded in the subject of a story, as the Chronicle was with the Convention Center management, even their closest allies lose. Poor Rick Allen, the Tee Center contractor, believed what he read in the daily newspaper and became so un-witting that there were any loose ends that he accepted $7,000 in campaign donations from the top Marriott executive. Augusta has another year to take the time to fix all the holes in SPLOST while the city and the region wrest with the burgeoning TSPLOST debacle which centers on Augusta also. Take the time. Fix the holes. There are not many whole buckets of money left. This week Augusta radio talk show host Austin Rhodes of WGAC was heard being dismissive of the 7% increase in homeowner electric utility bills over the past five years from the controversial Georgia Senate Bill 31, which passed in 2009 with help from Senator Hardie Davis. SB 31 was heatedly debated because the bill guaranteed Georgia Power a separate 11.5% return on two new nuclear reactor units being constructed at Plant Vogtle on the Savannah River in Burke County, giving opportunity for all manner of cost-shifting hanky-panky. The law also came under fire for paying advance profits of over $1 billion over and above the costs of building the units. The Georgia Public Service Commission, who had the staff to evaluate the technical parts of the bill and who actually has the rate setting authority in the state, was bypassed by the legislature, prompted and cheered on by a flock of as many as 70 lobbyists clogging the aisles. Finally, the legislation exempted industry from the onerous special rate increases, meaning that the full burden falls on small businesses and residential payers. Augusta’s Senator Hardie Davis was hardly alone in focusing on the jobs created for several thousand workers, many of them temporary construction craftsmen, while disregarding the costs to the millions of Georgians of the burgeoning rates. Let’s take a look at the effects of SB 31 so far on a residential power bill. On top of the SB 31 costs, one must also add the additional 1% TIA 2010 or TSPLOST tax that Hardie also voted for. The Hardie Tax and Rate Increase Total is nearly $13. The Hardie cost increases are compounding every year against falling wages and salaries. To conclude, that is a power play Augustans cannot afford. All the confirmation Austin and everyone else should need was said by fellow WGAC show host Clark Howard in the clip below. Hardie Davis is Georgia Power’s best friend. Can Augusta afford him as its mayor with such disregard for the people? This post will be edited to add hyperlinks to underlying documents demonstrating the points. The pyramiding effects of Georgia’s new transportation tax, nicknamed TSPLOST, on food price inflation is explored on a gored deer in this June 2012 presentation. Bucky got gored and so did Georgian’s finances.